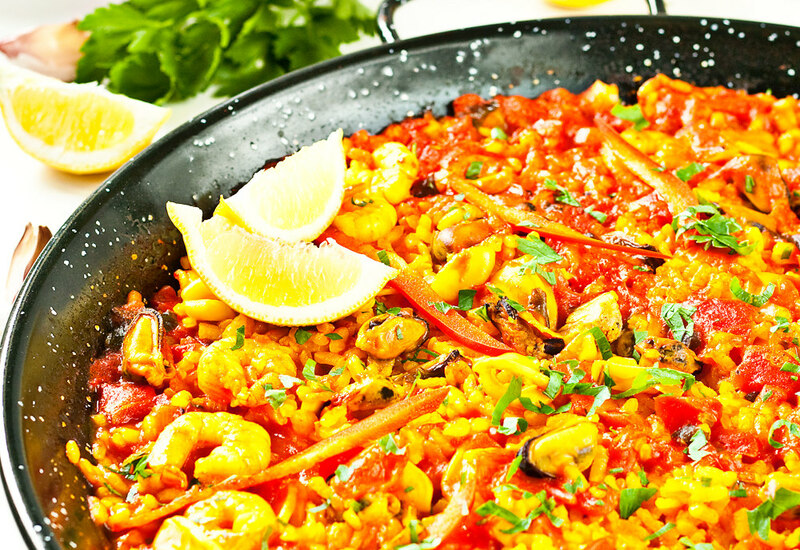 Welcome Spanish flavors to your kitchen with this delicious seafood paella recipe, a traditional favorite of the Iberian peninsula. The rice is nicely scented and colored from the saffron and parsley and lemon add freshness and zest as a final touch. This is a great dish to serve to a group of people and is perfect for dinner parties or Sunday dinner. Make a batch of sangria and you've got a party! Discard any unopened mussels. It means they weren't alive before cooking and they may be unsafe to eat. Sausage and chicken are good additions to the paella too; saute them in a separate skillet and add to the paella at the end of cooking. You can buy paella pans at kitchen stores or on Amazon.com. If you don't want to buy one, you can use a large shallow skillet, preferably a cast iron but any will do. Per Serving: 489 calories; 17g fat; 45.2g carbohydrates; 37g protein; 207mg cholesterol; 1284mg sodium. I have never cooked Spanish food before and I was really nervous! This Paella was quick, easy, and made my 2 year old happy... Score! Not very much flavor. I ended up adding garlic salt, Cajun seasoning, and chili powder to try and give it more flavor. Ended up more like a jumbalya than paella and was delicious.